First, Check the Master Page name that assigned to your site. Go to Site Action –> Site Settings –> Look and Feel –> Master Page. Below Site Master Page –> Check the name of assigned Master Page. Open SharePoint Designer –> Open your site –> From left side Click on Master Pages –> Right Click on your custom Master Page –> Check Out. Right Click on Master Page –> Edit File Advanced Mode. Below the <Header> tag add the following code. From left side Click on Master Pages –> Right Click on your custom Master Page –> Check In. Master Page Gallery will be shown –> Below Approval status Pending –> Approve your Master Page By clicking on Arrow and select Approve and Reject. Open your site with user who can manage permission. the ribbon should be shown like this. 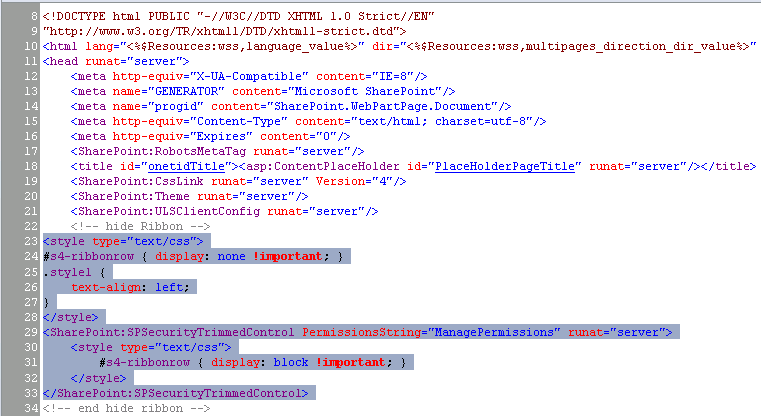 See also How to hide the ribbon in SharePoint 2013 check this hint.